From 2014-2015 I worked as a Associate Research Specialist at the Wisconsin Geological and Natural History Survey, and I conducted research in southwestern Wisconsin, the Driftless Area. This area of southwest Wisconsin, northeast Iowa, southeast Minnesota, and northwest Illinois has no evidence of glaciation due to the highly developed fluvial landscape and lack of glacial landforms and till (sediment deposited directly by ice). 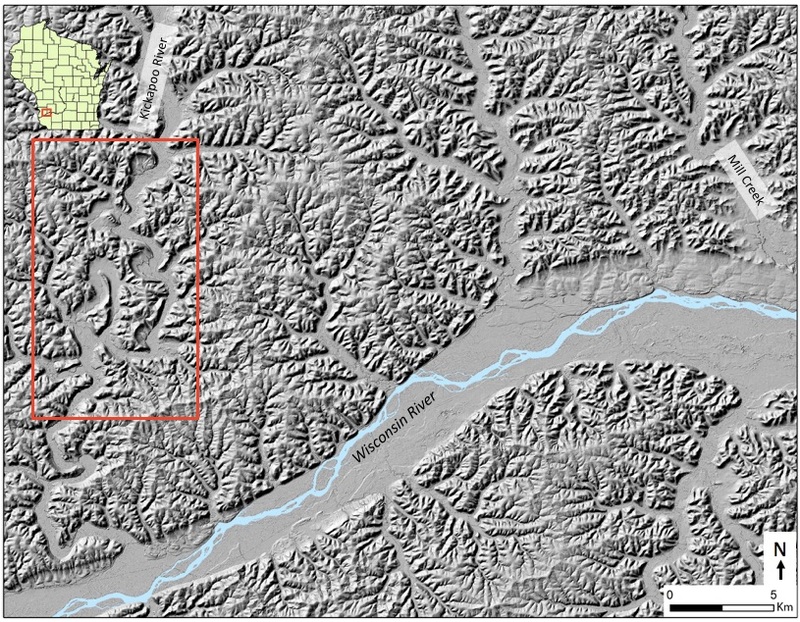 However, tributaries in the Driftless Area collected and preserved enormous volumes of sediment from the nearby Laurentide Ice Sheet. During the peak of the Late Wisconsin glaciation (correlated to the global Last Glacial Maximum, 26-19 thousand years ago), it is hypothesized that the lower Wisconsin River was a braided river system transporting enormous volumes of coarse outwash sediment from the Green Bay Lobe of the Laurentide Ice Sheet. This high coarse sediment load in the river dammed the tributaries to the lower Wisconsin River, causing them to turn into lakes/slackwater basins. Today we can recognize this by the presence of laminated silt and clay sediments in cores collected in the Kickapoo River, Mill Creek, and Pine Creek, all tributaries to the lower Wisconsin River. Radiocarbon ages bracketing the lake/slackwater sediment constrain its deposition to 21-20 thousand years ago, indicating that these Geoprobe cores of Late Quaternary sediment can be used as proxies for ice margin fluctuations of the Green Bay Lobe of the Laurentide Ice Sheet.